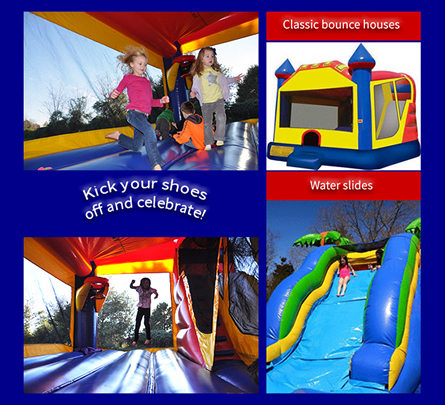 All American Bounce House Rentals is owned by a military veteran and a proud, patriotic family. The family’s core values emphasize integrity, honor, and a commitment to those they owe gratitude–their customers. Their story, like so many other stories made in America, exemplify sacrifice and duty above all else. All American Bounce House Rentals began operating in 2014 when the opportunity to provide a service to families in the community emerged. As a small family-owned and operated business, they know the importance of those they rely on most. The family’s work ethic and values come from an experience grown from a life lived literally “from sea to shining sea”. Moving from California to North Carolina, the family made residence in Shelby, NC. Company owner, Justin, tested his and the family’s strength when he chose to serve his country in the Marine Corps infantry from 2003-2007. During his deployment to Iraq for over 8 months, he fought in the Battle of Fallujah from 2004 to 2005. Two other deployments, non-combat tours, allowed Justin to prove his dedication to his country and solidified his pride in the U.S.A. His experience as a Marine resonates with him to this day and Corps values inform his business approach. By embracing this commitment to the mission at hand, the motto “Semper Fidelis” is a constant in the company’s service.